About Us - Carousel of Light Inc. The Carousel of Light was created by Lance Shinkle, an art﻿ist from Falmouth, Mass. It is a functional work of art, a mixed-media masterpiece. Lance began the task of hand-carving each horse and chariot in 1988. His plan was to create a working carousel with a nautical theme, which would operate to raise money for non-profit organizations. The creative process begins with an original drawing by Lance, which is transferred onto sets of wooden planks, each plank a cross-section of the horse. The horses are made from eastern white pine bought from Cataumet Sawmill of Falmouth. Lance devised the carving system to achieve animated forms and greater strength. The planks are laminated together to create a hollow block of wood in the rough shape of a horse. A chain saw is then used to carve the contour. Finally, the figure is detailed and finished with hand chisels and sandpaper and the horses are color-dyed and painted. Lance has created 32 horses, two wheelchair-accessible chariots and three ornamental sculptures. 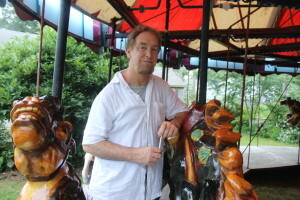 He has also painted 12 colorful scenery panels to decorate the carousel. The nautical-themed carousel includes sea horses, mermaids and fishing nets in the same windblown style used for the horses and chariots. The Carousel of Light is one of the few hand-carved carousels in America. Most modern carousels have fiberglass horses made from pre-fabricated molds. While working on the horses, Lance also searched for a carousel mechanism and calliope, which creates music. In 1993, he found a vintage 1947 Allan Hershell Model in Cincinnati, Ohio. With private loans from friends and supporters, he purchased the mechanism. The carousel was on display and operated first at the Barnstable County Fair in Falmouth. It also operated in Mashpee Commons and on Main Street, Hyannis. To be with his ailing father, Lance moved to California in 1999 and brought the carousel with him to run it there. After his father died, Lance returned to his home in Falmouth in 2009. In February of this year, Lance flew to California and arranged for the shipment of the carousel on two large trucks to his workshop in Falmouth. Lance has agreed to donate his masterpiece to the Carousel of Light Inc., a A501(c)(3) federal non-profit corporation. In 2014, the carousel had it's encore inauguration at the Mullen Hall School in Falmouth Village. For seven weeks, we hosted 15,000 riders. many of these rides were donated to senior and children organizations. The carousel will operate in the same location from Memorial Day thru Columbus Day in 2015, thanks to the foresight of the Falmouth School Committee, Superintend ant Dr. Bonny Gifford and Principle Nancy Ashworth. 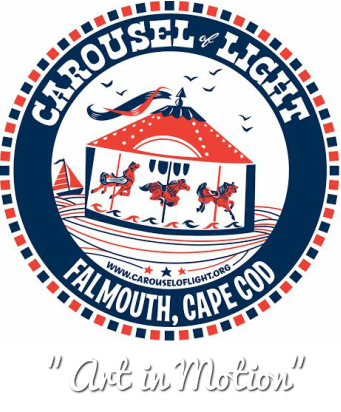 Donations can be made payable to Carousel of Light Inc., 894 Main Street, Falmouth, MA 02540. Call 774-521-8408 for more information.